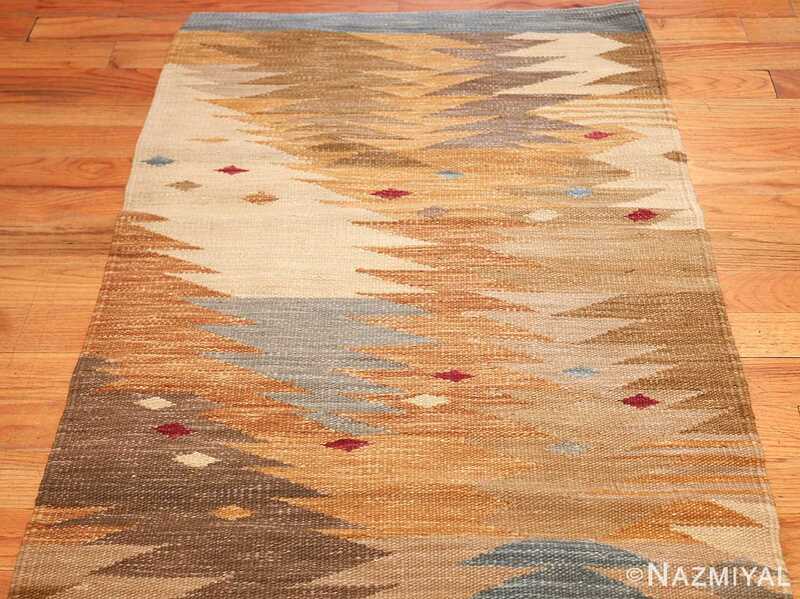 Beautiful Long and Narrow Vintage Swedish Inspired Modern Kilim Runner Rug , Country of Origin: India, Circa Date: 21 Century – The gentle earthy tones and autumn colors of this Swedish kilim inspired modern rug renew our connection to nature. 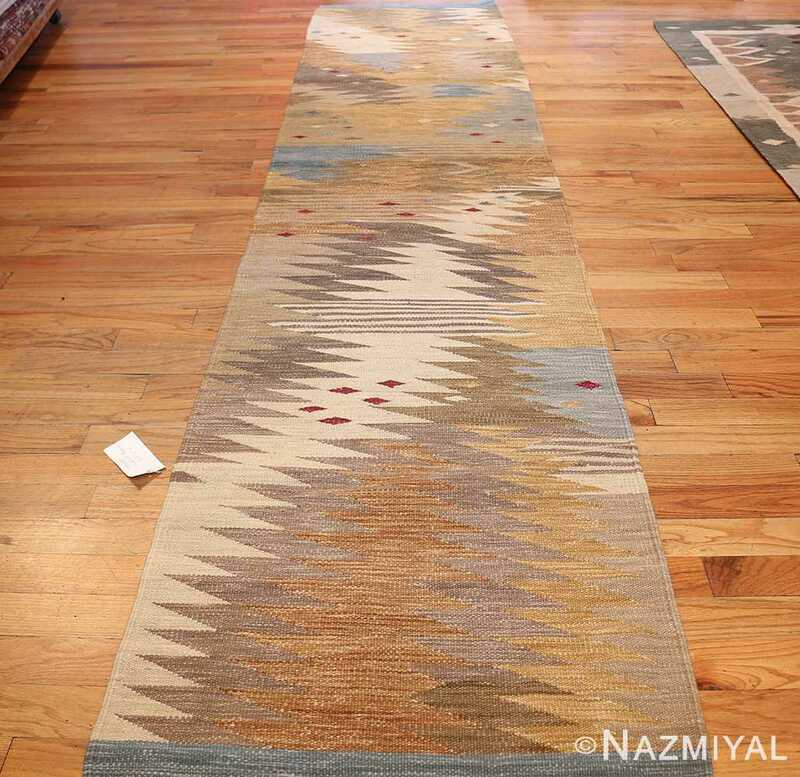 The overall design of this magnificent kilim rug meanders like flowing water with ivory highlights representing the reflection on the water’s surface. 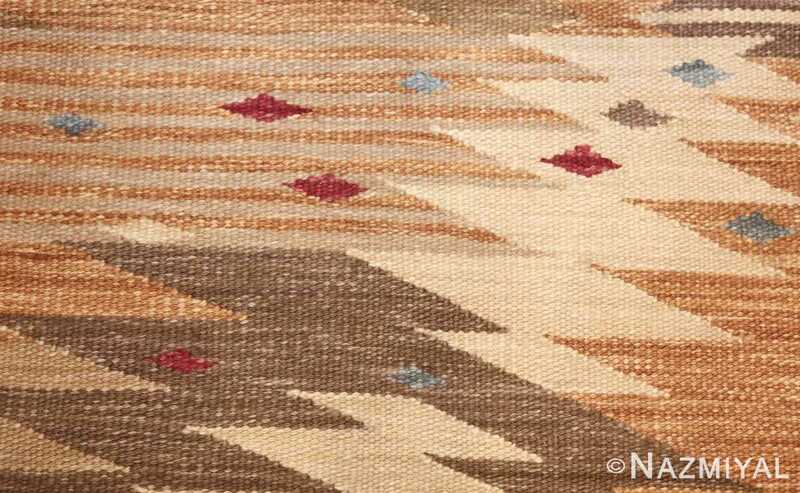 Fish swim peacefully across the runner rug, all traveling from left to right or right to left. The design is asymmetrical, allowing the inspired Scandinavian designs to float gently into each other. The meandering water ripples lengthwise along the rug, while horizontal lines and fish create direction and horizontal motion. Subdued blues blend beautifully with the earth tones, creating a peaceful and serene effect. The geometric shapes of the inspired Scandinavian rug cause the eye to travel back and forth along the horizontal lines created through sharp angles and shapes. 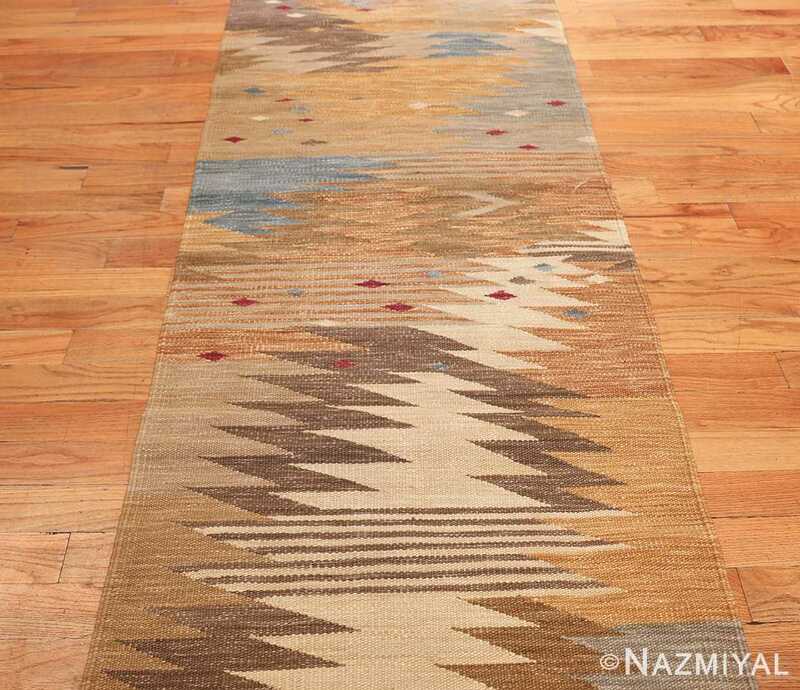 The shapes give the modern Kilim runner rug direction, but also serve as a contrast to the idea of flowing water that is the central theme of the modern contemporary rug. 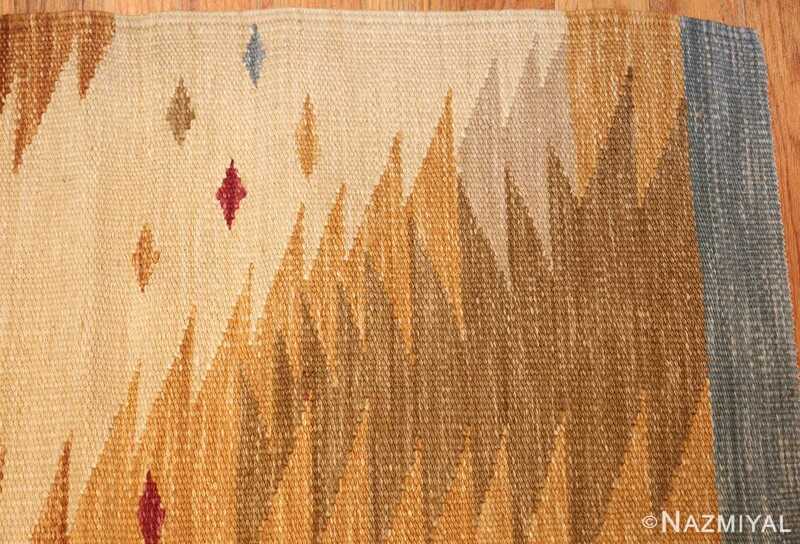 The design seems as if it could travel along its winding path forever and extend beyond the boundaries of the rug. Two blue ends serve as stopping points for the eye and create a frame for the scene. This is a beautifully designed rug that captures a peaceful natural scene. 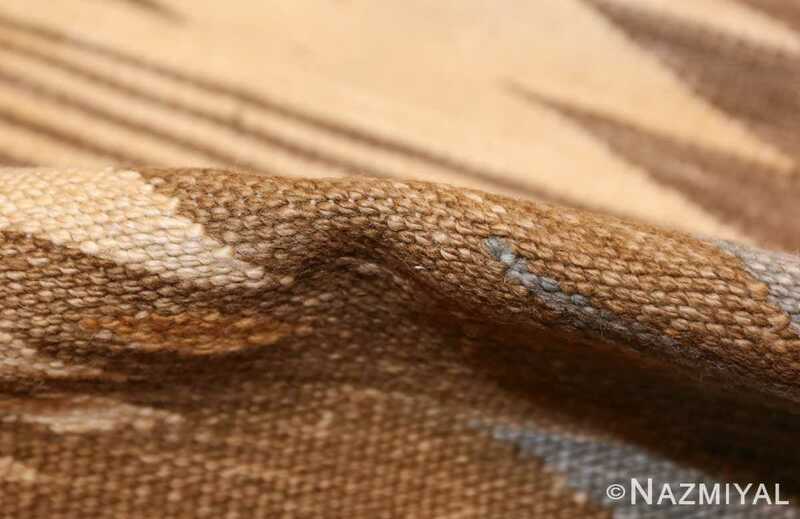 It uses both blended and contrasting elements to create interest and an organic feel that mimics the natural world. 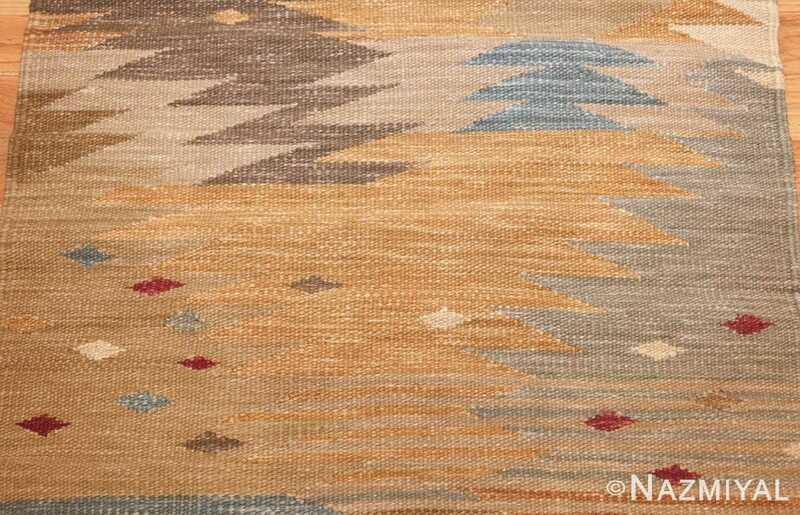 The tranquil scene of this inspired vintage rug would make an excellent addition to any design that needs to bring an element of the natural world indoors. 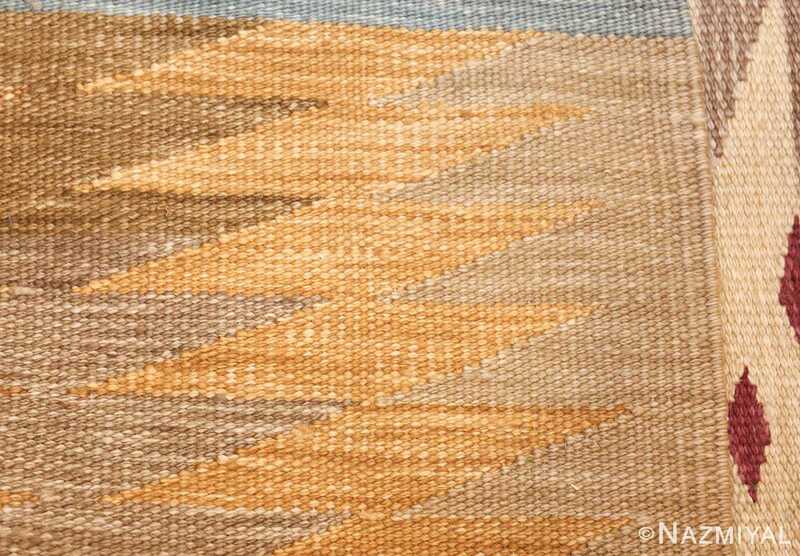 Scandinavian, minimalist, modern organic, and any design that calls for simple lines would be enhanced by this modern Kilim runner rug. The bold geometric shapes are softened by a feeling of flowing water. This is a truly captivating piece that adds interest to any long area, or hallway, or open space. It adds a calm feeling to any room’s interior decor.